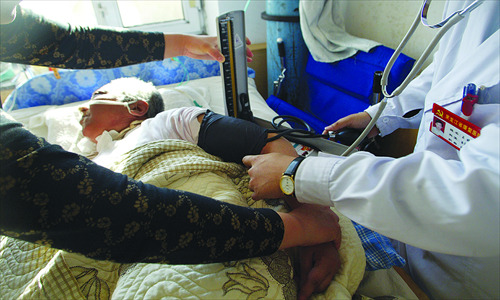 In the Beijing Union Hospital's geriatric ward, a 77-year-old man lies in bed, with a long breathing pipe in his throat. Suffering from chronic obstructive pulmonary disease, a balloon-sized alveolus in his lungs once prevented him from breathing. "We saved his life with a breathing machine, but we were told never to pull it out afterwards," Liu Xiaohong, the director of the geriatrics section, remembered of when the man was first admitted in March 2009. Today, due to having spent more than three years in bed, the old man also suffers from a series of complications, living in agony due to the feeding tube and urethral probe needed to keep him alive. Still conscious, the old man cannot help but complain to his children, "Why don't you listen to me? I don't want to have such a painful life." This case is by no means an isolated one. Thanks to the rapid development of life-support treatment, natural deaths, especially for the elderly or those suffering from incurable diseases, have been drastically changed. "With artificial breathing and heart pumping, life-support treatment makes it possible to keep a patient from death, but it is only technically being alive, with no quality or dignity of life," said Luo Diandian, a retired cardiologist. After witnessing numerous deaths at work, Luo, together with some of her friends, is now actively advocating "living wills," giving patients the right to choose to die in dignity, instead of lingering for ages in the ICU. Behind thick glass walls, critically ill patients are naked under white quilts, covered in life-support mechanisms, tubes and drips. Luo, 61, now a writer, believes it is her fear of dying in the ICU with no loved ones around that prompted her to start a website named "Choice and Dignity" in 2006 so as to help spread the message to the public. "It's something that every individual who cares about the quality of life will consider. As a clinician, I know exactly what's going to happen to me at the very final stage of my life, and with this living will, I can at least free myself, as well as my family, from this dilemma," said Luo. The US "Five Wishes" form of living will, created by the NGO Aging with Dignity, has been widely applied in 42 states and the District of Columbia. The Chinese version "My five wishes," in plain language, lists out what a patient wants or not, such as the circumstances of their medical services and life support treatment, if so desired. Luo emphasized that based on the WHO definition of the "final stage of life," a living will is valid when the person is diagnosed with a terminal disease and has been clinically estimated as having a life span of less than six months. The person must also no longer be able to full express their views on their health problems. However, the doctors reached by the Global Times all agreed that medical staff from different countries would have very different opinions in terms of a dying patient's survival rate. To this, Luo emphasized that instead of providing a fixed answer to the questions posed by the concept of "dying in dignity," the living will simply offers another option for healthy people to start thinking of how they wish to die. "While there is a default consensus under China's current healthcare, social and cultural system that as long as the patient doesn't have financial issues, doctors have no rights to stop or give up medical treatment, including always doing everything to save a dying and terminal patient, the living will allows them to go beyond the status quo," Luo explained. "For those who have a very strong survival instinct and fight heroically to stay alive no matter how painful it is, I have nothing but respect. It doesn't conflict with my concept as long as they feel it's a dignified and graceful death," Luo emphasized.